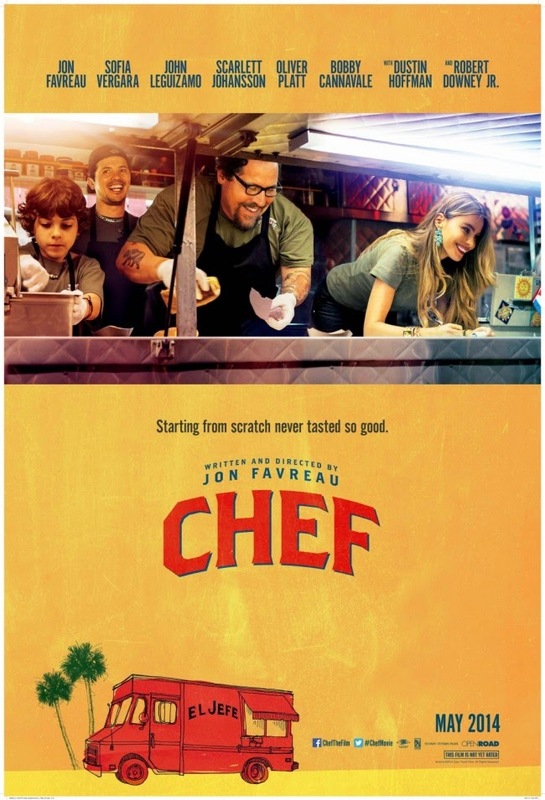 Vue Cinemas have been celebrating Jon Favreau’s long-awaited film Chef by creating street food recipe cards. Chef is a film about Chef Carl Casper who gives up his job in a restaurant, when his integrity is challenged and goes on the road with his friend, ex-wife and son in a food truck. I've not seen it yet, but I'm looking forward to it. Vue Cinemas challenged me to come up with some street food to be made into recipes cards and I decided to go for a spot of Italian food. Italy is somewhere I've always wanted to visit, I just haven't managed yet. I do love italian food though. For this recipe I wanted some Italian inspired food that would be easy to eat as you walked. 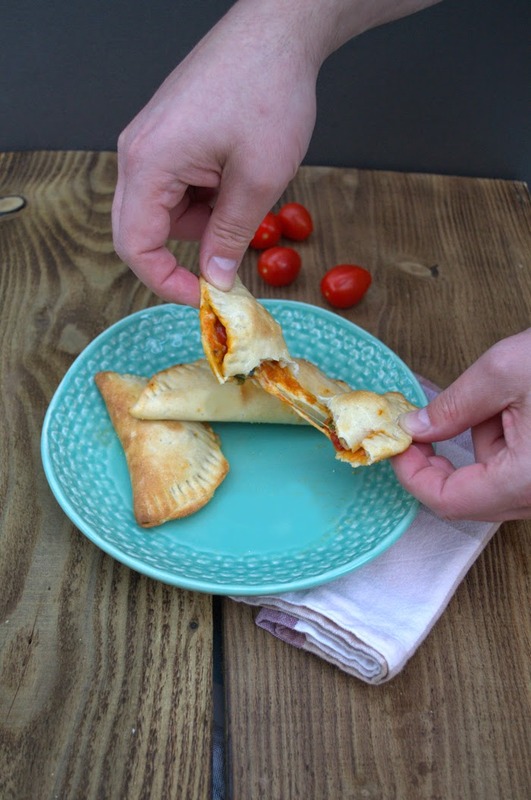 Pizza is great, but it can be messy to eat with your hands, so I made mini calzone with the flavours of a caprese salad. The fresh flavours of tomato, mozzarella and basil. You just can't beat it. I made my standard white pizza dough, cut it into circles, added some homemade pizza sauce and topped with a slice of fresh mozzarella, sliced cherry tomatoes, some torn basil and a good grinding of black pepper. I then folded them and sealed them with a fork, pricked them and baked until golden. Graham was drafted in to tear open the calzone so I could take a photo. He burned his fingers on the first one and was rather pathetic about it. He has delicate girls hands when it comes to heat. I wonder if we build up resistance to heat as cooks? Head over to the Vue website to read all the street food recipes including this one. Disclosure: I developed this recipe for Vue Cinemas.. I was not required to write a positive review and any opinions expressed are my own. Love Calzone, probably more than pizza. These are a nice little snack size, very tasty looking. Fell in love with calzone when I lived in Italy many years ago. 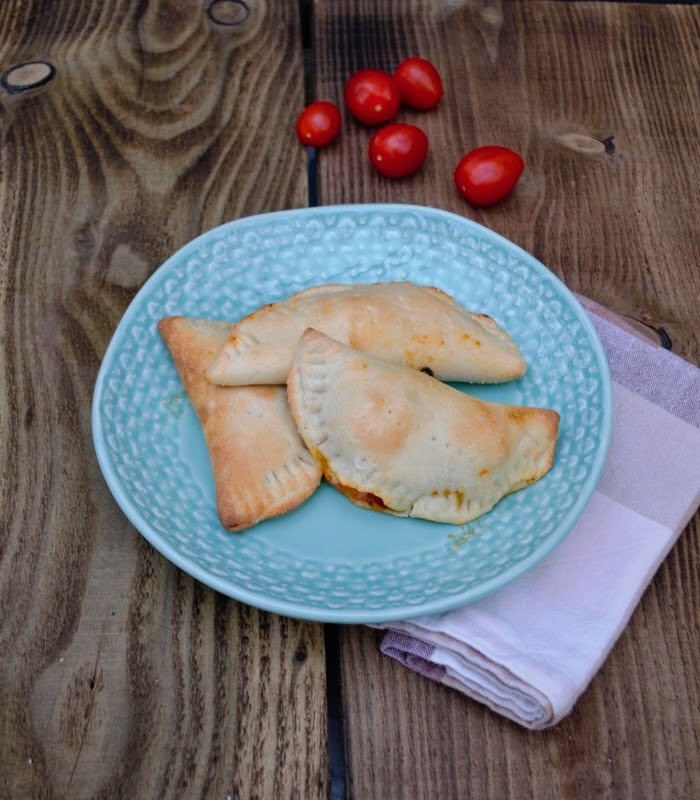 Calzone means pocket in Italian sort of like our Cornish Pasty! It is a bit like that isn't it, although the dough gives it a totally different feel from the pastry. Those look so tasty Jac - a lovely idea. I'm looking forward to seeing the film and also to making it to Italy one day! I'm with you on both of those Choclette. A woman after my own heart. This look wonderful Jac! I have very fond memories of stuffing my face with calzone as a teenager in Venice when I went inter-railing after A-levels - they were practically the only food there my friend and I could afford. Love your wee version as I bet my children will too - they adore mini versions of just about anything! Hey Vanesther, these would be great for your wee ones and what fabulous memories. they look like empanadas - so cute! And poor Graham, getting his delicate hands burned. Bless ! Ahhh yes, I suppose they do. Now that is another thing I haven't tried. Bless indeed. I am sure he will love them then Deena, just let them cool down a bit first lol! I can't hear the word 'calzone' without thinking of Ben in 'Parks & Recreation'. These look great! Yummy , love teh sound of ur mini calzones ! Sadly neither have I been to Italy nor have I seen this film yet !